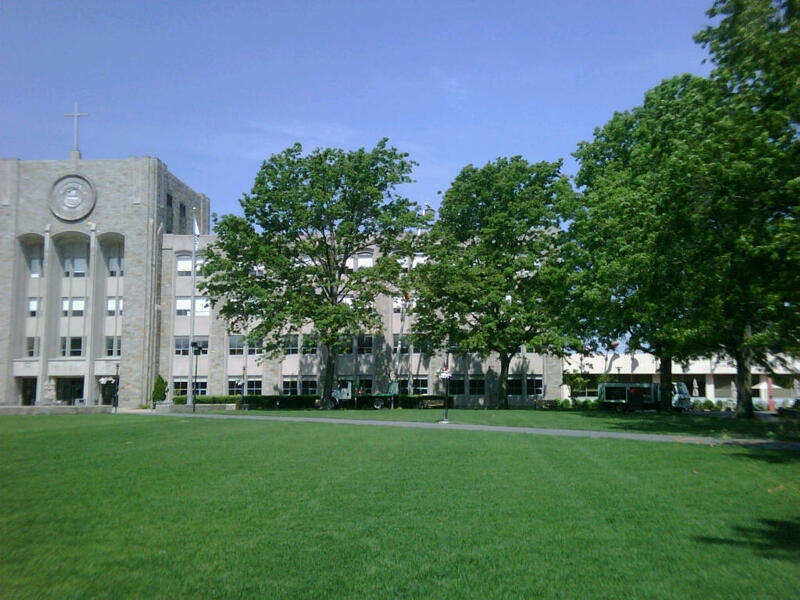 Almstead was asked to do some work at St. John’s University recently. They had done some construction about 7 years ago in a lovely quadrangle with 8 mature pin oak trees. They worked around the trees, then resodded the lawn. The grass looked fine, but the pin oaks, which had remained during construction, weren’t thriving. This is something we see commonly: after construction, everything LOOKS great, but the soil has been compacted around the tree roots by feet and machinery (which can happen even without construction on a busy campus). Eventually, the trees start to decline as their feeder roots struggle to grow and find nutrition in the dense soil. Above, you can see the tree closest to the building is starting to look stressed, lacking a full canopy. We had several tree care jobs to perform here, so we brought in several different crews: one group did tree trimming, another did air spading, and another took care of the hydraulic soil injection. That way, we could lessen the disruption to the campus. Our tree trimming crew worked on identifying and pruning diseased and dead branches – important for the health of the tree, but also for the safety of people walking on campus. We also removed the sod and performed air spading around the roots. The aid spade loosens the soil and blows it away from the roots using compressed air – without damaging the roots. There’s no risk of nicking the roots – or a utility line – as could happen with a traditional spade. We can check for any other problems (insect or disease) while the roots are exposed. Then we just fill the soil back in, sometimes adding some extra amendments to keep the tree healthy. In fact, last year, the University needed to run a water line through the root zone of this group of trees. We worked with the contractor and uncovered the roots with the air spade. We made clean cuts in the roots where necessary as he ran the line through. This year, we’re performing hydraulic soil injection of custom blended fertilizer and soil additives for these oaks, to help them stay strong. (There’s Leo in the picture on the left, giving a tree its vitamins). With some care and extra attention, these oaks should be there for several generations of future students.